Home / Blog / What’s the difference between ferrous and non-ferrous metal? 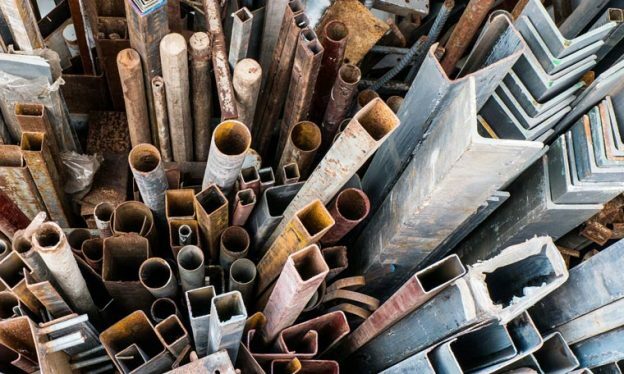 What’s the difference between ferrous and non-ferrous metal? The simple answer is that ferrous metals contain iron and non-ferrous metals do not. The more in-depth answer is that ferrous metals and non-ferrous metals each have their own distinctive properties. These properties determine the applications they are most suited for. Some common ferrous metals include alloy steel, carbon steel, cast iron and wrought iron. These metals are prized for their tensile strength and durability. Carbon Steel – also known as structure steel – is a staple in the construction industry and is used in the tallest skyscrapers and longest bridges. Ferrous metals are also used in shipping containers, industrial piping, automobiles, railroad tracks, and many commercial and domestic tools. Ferrous metals have a high carbon content which generally makes them vulnerable to rust when exposed to moisture. There are two exceptions to this rule: wrought iron resists rust due to its purity and stainless steel is protected from rust by the presence of chromium. Most ferrous metals are magnetic which makes them very useful for motor and electrical applications. The use of ferrous metals in your refrigerator door allows you to pin your shopping list on it with a magnet. Steel is made by adding iron to carbon which hardens the iron. Alloy steel becomes even tougher as other elements like chromium and nickel are introduced. Steel is made by heating and melting iron ore in furnaces. The steel can is tapped from the furnaces and poured into molds to form steel bars. Steel is widely used in the construction and manufacturing industries. Carbon steel has a higher carbon content in comparison to other types of steel making it exceptionally hard. It is commonly used in the manufacturing of machine tools, drills, blades, taps, and springs. It can keep a sharp cutting edge. Alloy steels incorporate elements such as chromium, nickel and titanium to impart greater strength and durability without increasing weight. Stainless steel is an important alloy steel made using chromium. Alloy steels are used in construction, machine tools, and electrical components. Cast iron is an alloy made from iron, carbon, and silicon. Cast iron is brittle and hard and resistant to wear. It’s used in water pipes, machine tools, automobile engines and stoves. Wrought iron is an alloy with so little carbon content it’s almost pure iron. During the manufacturing process, some slag is added which gives wrought iron excellent resistance to corrosion and oxidation, however, it is low in hardness and fatigue strength. Wrought iron is used for fencing and railings, agricultural implements, nails, barbed wire, chains, and various ornaments. Non-ferrous metals include aluminum, copper, lead, zinc and tin, as well as precious metals like gold and silver. Their main advantage over ferrous materials is their malleability. They also have no iron content, giving them a higher resistance to rust and corrosion, and making them ideal for gutters, liquid pipes, roofing and outdoor signs. Lastly they are non-magnetic, which is important for many electronic and wiring applications. Aluminum is lightweight, soft and low strength. Aluminum is easily cast, forged, machined and welded. It’s not suitable for high-temperature environments. Because aluminum is lightweight, it is a good choice for the manufacturing of aircraft and food cans. Aluminum is also used in castings, pistons, railways, cars, and kitchen utensils. Copper is red in color, highly ductile, malleable and has high conductivity for electricity and heat. Copper is principally used in the electrical industry in the form of wire and other conductors. It’s also used in sheet roofing, cartridge cases, statutes, and bearings. Copper is also used to make brass, an alloy of copper and zinc. Lead is a soft, heavy, malleable metal with a low melting point and low tensile strength. It can withstand corrosion from moisture and many acids. Lead is widely used in electrical power cables, batteries, building construction and soldering. Zinc is a medium to low strength metal with a very low melting point. It can be machined easily, but heating may be required to avoid cleavage of crystals. Zinc is most widely used in galvanizing, the process of applying a protective zinc coating to iron or steel to prevent rust. Tin is very soft and malleable, ductile with low tensile strength. It’s often used to coat steel to prevent corrosion. Tinplate steel is used to make tin cans to hold food. In the late 19th century, tin foil was commonly used to wrap food products, but has since largely been replaced by aluminum foil. Tin is can also be alloyed with copper to produce tin brass and bronze. This entry was posted in Blog, what we collect and tagged copper, environmental, ferrous, lead, metal, Metal Recycling in Toronto, non-ferrous, scrap aluminum on October 21, 2018 by Dev Support.